The fat lady arrived a little late but then sang lustily. A champion was born. 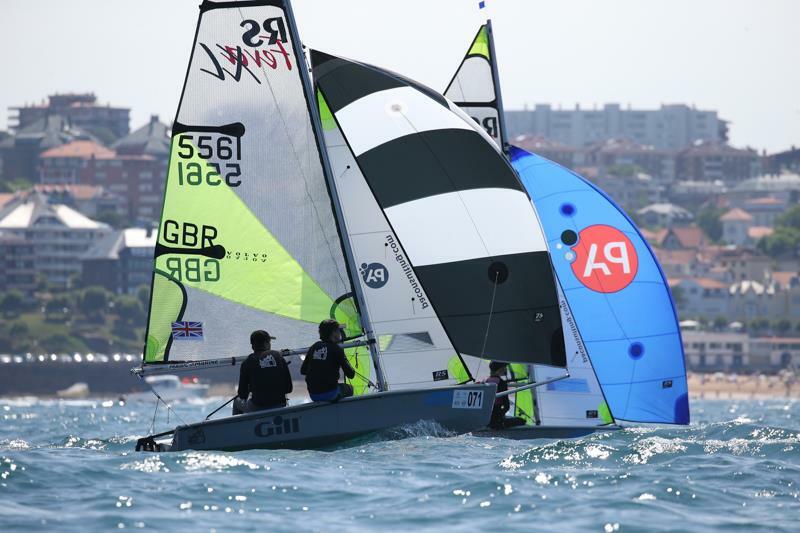 William Pank and Finlay Dickinson from Norwich School sailed smart and fast all week and were crowned fully deserving 2016 PA Consulting/Allen RS Feva World Champions. The final day was clearly going to be quite nerve wracking. After a fitful start to the daily breeze build up the call was made to race inside the bay. New wind direction, new tidal conditions, nous and flexibility were called for. And so it proved with in the first race going left being good, race two it was right and race three it was left again. It could have been the other way round but you get it! The PRO was on fire and managed to get that third race in to give all fleets a full series. Some of the best PRO'ing we've seen at a Worlds! The racing was hard and impossible to get right every time. Final days 'winners' were Charles Elliott/Ethan Miles who racked up a healthy 20pts, so imagine how it fared for others! So after 13 races, eight in the final series with one discard and five in the qualifying series William Pank /Finlay Dickinson stood on the top step of the podium with a 24pt lead. Freddie Peters/Louis Johnson (HISC) survived a last minute arbitration penalty in the penultimate race to take 2nd by one point from the impressive young Swedes Oscar Andersson/Ragnar Alfredsson. Kiwis Eli Leifting/Rose Dickson from Royal Akarana sailed a superb series to tie up wooden medal in 4th while European Champions Jack Lewis/Lucas Marshall (Draycote) were 5th. 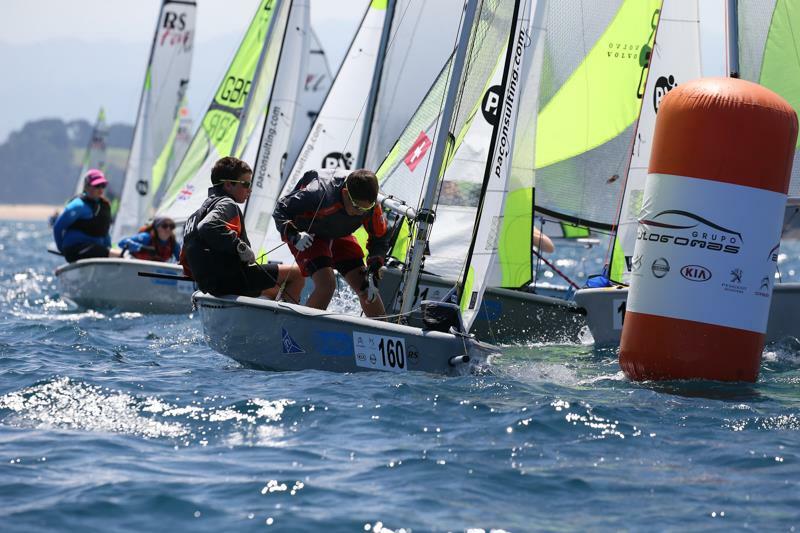 Local Spanish lads Pablo Fernandez/Laureano Salcines were also impressive in 12th in their first Worlds having started their RS Feva sailing only last year. The ladies competition was particularly fierce this year with the top three separated by only 10pts ie approximately 1 place per race! Julia Barnes/Lauren Paton (RTYC) won the title from Italians Farao Tea/Perbellini Federica and Dutch women Nynke Verwoerd/Annabel Wickel. Outstanding the Junior title went to the overall winners! Step forward William Pank/Finlay Dickinson again! Indeed all 3 of the top Juniors were top 10 overall. So silver was nabbed by Blake Wilson/Sam Dickinson (HISC) while bronze was owned by Joshua Davies/Blake Tudor (Brightlingsea). The Argentinian Soldano family dominated the Silver fleet. Dad Pablo sailed out to the racing area every day with both his small boys Carlo and Andrea. Once there one of the boys would get onto an Italian Rib and the boys was swap over after every race. For the prize giving dad sat in the stands while the two boys collected their prize. Cute doesn't begin to describe it. There were six prizes but the podium was completed by Alexander/Bertie Ratsey (RWYC) on the second step while third step was occupied by Sian Talbot/Eloise Clapson-McBride (LLSC). Bronze fleet also had runaway winners with Patrick/Conor Whelan (HISC) leading the merry way. Aussies Sylvie/Rohan Stannage from Hunters Hill SC in Sydney took an amazing second. Their parents almost missed the glorious bullet on the last day by accidentally watching the wrong fleet for most of that race! And from the Royal Malta YC Megan Ferry/Emilie Gregory took third from fellow RMYC members Alexander Bartoli/Nick Bonello Ghio on a tiebreak! Finally we ought to also report the two special prizes awarded by the host club, the Royal Santander YC. Travellers trophy was clearly won Aucklanders Eli Leifting/Rose Dickson. Courage award was an easy decision after the performance by Sylvie Stannage from Sydney having raced all week with a broken arm. Nothing like a fit, keen brother – Rohan - in the boat to help with the mainsheet when it all got a bit much! Hats off to Sylvie for that effort! So that was it folks! Thanks to our sponsors PA Consulting, Allen Brothers, and RS Sailing for making it all happen. A particularly auspicious link for us with PA Consulting being an integral technology partner to BAR and winning the AC event in Portsmouth last weekend!